A young Jehovah's Witness has died after giving birth to twins, amid claims that she had refused a blood transfusion because of her faith. Emma Gough, 22, of Telford, Shropshire, gave birth on 25 October. The Royal Shrewsbury Hospital said an internal review into the case would take place. The twins, a boy and a girl, are healthy and are being cared for by their father, Anthony Gough, 24. A friend said the family was going through "immense... turmoil and grief". "We follow the Bible and abstain from blood and I've got no reason to believe that Emma didn't share those views," the friend Terry Lovejoy added. Christine Harris, a friend of Ms Gough's mother-in-law Sham Gough, said: "The family have told me that a blood transfusion wouldn't have saved Emma." Tom Taylor, chief executive of the Shrewsbury and Telford Hospital NHS Trust, said: "We have offered our deepest condolences to the family, and our thoughts are with them at this difficult time. "Because events such as this are so rare, it is normal practice to undertake a full internal review and also to inform the coroner so an inquest can take place." An inquest has been opened and adjourned for a date to be fixed. 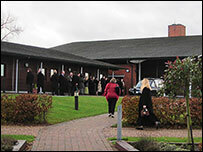 Emma Gough's funeral took place at the Telford crematorium at 1530 GMT. Jehovah's Witnesses refuse blood transfusions because they believe that God has forbidden it in the Bible. They believe that accepting a blood transfusion is a sin. Head of Science and Ethics at the British Medical Association, Dr Vivienne Nathanson, said: "If somebody believes that having blood will excommunicate them from their religious beliefs, then they will often say no and accept the risk of death."